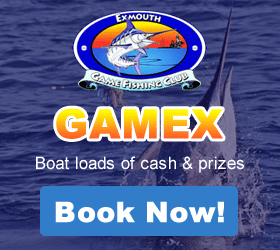 Join us on an Island fishing adventure. 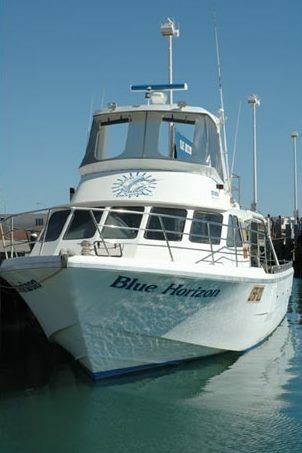 Get a group together or join us for our overnight fishing trips up to Long or Thevenard Island. Trips can just be overnight or up to 5 days. The boat departs the Exmouth Marina at 6:30am. On the way we throw the lures out and trawl for Sailfish, Marlin, Mackerel and Tuna. Once arriving at the fishing grounds we will bottom bounce for the rest of the day before heading into the islands where we will drop the anchor for the night and have a bit of the days catch on the BBQ for dinner. In the morning we have a cooked breakfast then depart back out to the fishing grounds for some more bottom bouncing till around mid day, then throw the lures back out and trawl our way home arriving back in Exmouth marina between 16-1700. If you wish to do more days that is fine. We can tailor the trip to suit your group. Enjoy a fishing adventure on the pristine water on the Blue Horizon, a luxury vessel equipped with the latest electronic equipment, 240 V power and air-conditioned. All your fish will be cleaned for you take home. All you need to bring is your sleeping bag if you wish to sleep in the air-conditioned cabin or swag if you prefer to sleep under the stars. If you have a favorite fishing rod you are more than welcome to bring it along. The boat departs the Exmouth Marina at 6:30am. On the way we throw the lures out and trawl for Sailfish, Marlin, Mackerel and Tuna. Once arriving at the fishing grounds we will bottom bounce for the rest of the day before heading into the islands where we will drop the anchor for the night and have a bit of the days catch on the BBQ for dinner. 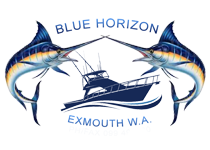 In the morning we have a cooked breakfast then depart back out to the fishing grounds for some more bottom bouncing till around mid day, then throw the lures back out and trawl our way home arriving back in Exmouth marina between 16-1700. If you wish to do more days that is fine. We can tailor the trip to suit your group.